Designed with little more than a passing nod to the international naval treaties of the inter-war period, the Imperial Japanese Navy's heavy cruisers were fast and heavily armed. Like the other vessels of the Japanese Navy, the heavy cruisers were technologically superior to and far more innovative than their Allied rivals, whom they met in many of the major Pacific Theatre battles, including Midway and Leyte Gulf. 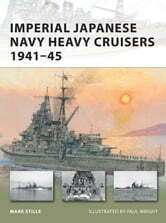 Mark Stille continues his study of the IJN of WWII with this fascinating topic, addressing the design and development of all 18 ships in the six heavy cruiser classes, from pre-war construction and mid-war alterations, to their operational histories and eventual fates.